When it comes to honeymoons and romantic getaways, it seems as though there are only a handful of popular options. A trip to Sandals, Jamaica; Cancun or Hawaii can make for a great and memorable vacation, but your stories will be the same as many others who have recently gone on honeymoons. Fresh Tracks wants to help you find a unique, romantic travel package for you and your sweetheart. 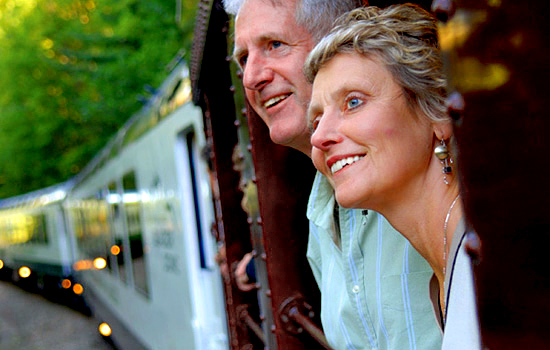 Take a look at our wide variety of Canadian vacations, such as the Romance by Rail package. This 8-day trip includes stops in Toronto, Quebec City and Montreal, three of the most romantic cities in North America. Book a Fresh Tracks vacation package today and find out why clients from around the world are so happy. "Our trip was wonderful," Fresh Tracks customer Dave Ruths said. "Thank you, and your associates, so much for a wonderful trip arrangement and the delightful and responsive interactions with you all along!" Are you looking for a more active honeymoon? The Rockies Rail and Golf Adventure package is a great choice for energetic newlyweds. Hit the links on the best courses in Whistler, Jasper and Banff by day and relax in Canada's finest spas by night. Fresh Tracks offers a wide selection of Canada vacation options. Whether you want to drive through the Rocky Mountains, hit the water on an exciting sea kayak tour or see Churchill, Manitoba's polar bears as they migrate to the Hudson Bay, we have got a vacation to fit your needs. Make your honeymoon, second honeymoon or surprise romantic getaway a perfect experience by booking with Fresh Tracks. Don't worry if you can't find a package that feels right for you in our list of pre-planned trips. Our staff has been trained to help clients customize their dream Canada vacations based on almost any criteria! Need more information on Romantic Getaways and Honeymoons in Canada? Talk to one of our Canadian travel Insiders who'd be happy to answer all your questions.